Anyone who has pulled one of these "We Care" envelopes out of her mailbox knows it is not a good sign. 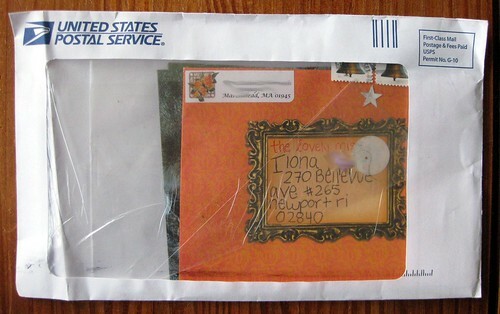 In this case, I thought the postal service did a pretty darn good job of preserving the letter. There's the front, with the address and return address still visible through the plastic window. 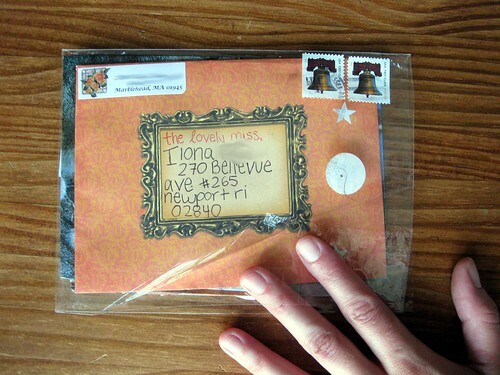 The letter was originally sent in a very thin plastic envelope, which opened and folded up at the corner. I imagine it was too flimsy for the sorting machines. That's my hand holding the envelope closed for the photograph. It wouldn't stay closed on its own. The good news is that it seems everything the sender included did actually make it to me, and she had enclosed all kinds of little stickers and papers and such... so my hat goes off to our postal service in this case. The envelope wasn't strong enough to make it through the sorting machines, but they salvaged it and the contents as well. Did you see what I got in the mail the other day? http://stupidhippy.com/2010/12/using-stuff-i-made-and-a-mail-problem-with-a-surprise/. I'm still shocked the stamps (from Murph) were still in there. 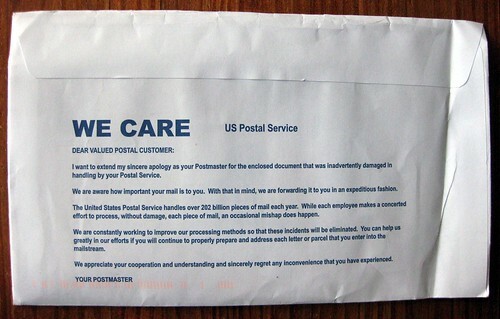 They didn't even put it in a "We Care" envelope, it was just sitting in there like that! I have a somewhat related question. I'm planning on sending out my Christmas cards with a wax seal on them. Have you had good experiences receiving sealed envelopes? Have you received broken or torn-off seals? I just don't think the effect would be as good if I put the sealed envelope within a larger, plainer envelope. Any advise? Thanks! Eliza - I have received wax seals in a wide variety of states, from perfect to perfectly mangled to missing entirely. I do not use sealing wax myself, so I can't tell you anything terribly specific, but I do know there are many different kinds of sealing wax. Some of them are made to be flexible and make it through the mail more successfully, whereas the "old-school" pure-wax types may be more brittle. Connoisseurs often mix their own blends for color and flexibility. Off the top of my head, I can say that the ones that "feel" more flexible on the envelope (as opposed to the ones that crack with a slight bend) are more likely to arrive intact. If you go to The Fountain Pen Network - linked in my Just Cuz sidebar section, underneath the rainbow pen near the bottom left - and search for wax seals or sealing wax, you will find a plethora of discussion and resources. I call those "We Care" bags "USPS body bags." I've received a fair share of those. And once my USPS.com stamp order came in one of those ... missing a number of stamps. The USPS does not have an online shipping issue resolution so you have to actually call, which was a pain, especially since it was an online order. 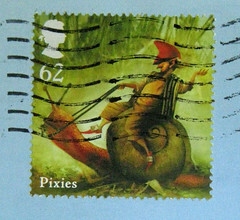 They did replace my stamps, but it took forever. Thank you! I'll try to use flexible wax and see how it goes! I can't resist adding a plug for Atelier Gargoyle sealing wax (www.ateliergargoyle.com), which is flexible and bulletproof. I've seen dozens of A. G. seals that have gone through the mail; on rare occasions a machine will scrape off an edge, but most of the time the seal is completely intact. I think it's one of those rare products that's probably unimprovable. Thanks, Joseph! I'll look into it--and I can only hope that my seals will end up looking as excellent as yours! 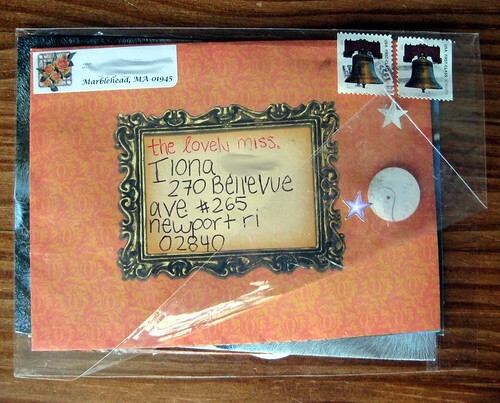 One of my postcards almost got eaten by the post office, and it arrived in a "USPS Body Bag".